Bandar Baru Salak Tinggi is a mixed development located in Salak South, the capital of Sepang. This freehold development is slightly out of the way at 45 minutes to the city centre of Kuala Lumpur. It is however located close to the Kuala Lumpur International Airport, at only 15 minutes away; giving cause for it to be termed as the "airport city". Bandar Baru Salak Tinggi is a self sustaining township that consists mainly of residential areas, as well as a latex glove factory as well as a few other random institutions. Most of the houses in the area consist of double storey terrace houses and a few shop lots. 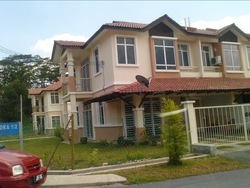 The terrace houses here start selling at prices as low as RM260,000 for 1,400 sf with 4 bedrooms and 3 bathrooms. There are also a handful of single storey terrace houses that are selling for RM260,000 as well, with the same number of bedrooms and bathrooms. Bandar Baru Salak Tinggi is considered to be a rather established development, and as such most of the houses sold here are pre-owned. As such, buyers of these houses can expect their homes to already be partially furnished, with most of them also having been fully renovated and extended. The usual furnishing that can be expected to come with the house are built-in kitchen cabinets and built-in wardrobes, with few other assorted furniture. The community was not built with any facilities in mind, and as such Bandar Baru Salak Tinggi does not comprise of any gated and guard developments. There is however a surau in the area which serves the community as well as a multi-purpose hall that is open for rent to the public for functions. As a fully self sustaining development, Bandar Baru Salak Tinggi has a full assortment of clinics, banks and schools. Within walking distance of many of the housing developments are both primary schools and secondary schools, while local banks such as CIMB, Maybank, BSN and Public Bank are easily available. Also within the neighbourhood is the NCI Hospital for emergencies. The closest shopping mall, Alamanda, is however quite far at a 25 minutes drive away. Bandar Baru Salak Tinggi is located beside a main trunk road of the highway, Road 820, which connects directly to the North - South Highway. The closest train station is the ERL Express which is 15 minutes away, which provides transport to the main Kuala Lumpur train station, the KL Sentral. Being one of the only housing development on the outskirts of the city close to the Kuala Lumpur International Airport, traffic in Bandar Baru Salak Tinggi is generally smooth at all times of the day. There are however times during peak hours of the day where congestion happens on the the main turn off from Road 820 into the housing development. This is however the only congested part, and traffic is usually smooth sailing all the way from here to and fro. The neighbourhood of Bandar Baru Salak Tinggi is one that was built almost exclusively targeting the people who work in the Kuala Lumpur International Airport as well as the factory workers who work in the area. As such, buyers may expect a wide range of residents from all walks of lives, ranging from air traffic controllers to factory workers. Bandar Baru Salak Tinggi is a development that does not appear to be good as an investment, as it is located too far out from the city. It could however be considered as a rental property for tourists who need an overnight place to sleep; however transportation to get to the houses would be an issue. As such, Bandar Baru Salak Tinggi appears to only be good for those who work at KLIA and need a home that is in convenient location to get to the airport. Looks like we couldn't find any matches. Try search on all Bandar Baru Salak Tinggi ads.